If you have additional inquiries, call us anytime at (954) 979-8600 or request a quote here and we’ll be happy to give you more information to assist you. 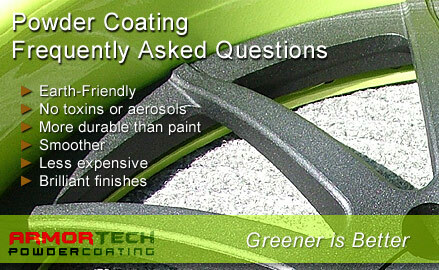 Why is powder coating superior to other finishing methods? Powder coating is smoother, longer lasting, cleaner, less expensive, and more ecologically friendly than just about any other finishing technique. No toxins or aerosols are used. Absolutely! We have customers all across the U.S. that only trust ArmorTech with their parts and projects. Please visit our Shipping Info page for more information. What types of surfaces can you finish? Anything metal is fair game. Aluminum and steel are the most common surfaces for powder coating. Can I powder coat calipers on a car that is tracked or raced? Yes you can, but we do not recommend it. The Brake system on cars that are tracked as part of high performance driving events (HPDE) or raced, can easily reach and surpass temperatures of 600+ degreess Fahrenheit. As difficult as it is to keep these vital components cool at the race track, the last thing you want to do is add another layer of coating to the calipers. Additionally, depending on the type of powder used to coat the calipers, the coating could begin to melt at track temps. Can you powder coat delicate, fragile parts, or antiques? Yes, as long as they are metal. We specialize in restoration but urge you to do your research first before coating any valuable antiques to see how their value may be affected. Can I choose different colors for different pieces? Yes. Choose as many colors as you’d like. If you need ten different parts coated ten different colors, we can do it. We have over 6,500 different shades and hues available. Please visit our Available Colors page to choose the right finish for you. Due to the highly-customized nature of our services, we cannot list prices for the thousands of parts that we receive. Typically, it is less expansive than painting, and it lasts much longer. If you would like a quote for your project, you can request a quote here. Is there a minimum order size or amount? We have a $100 minimum order. While there are maximum size restrictions, there is no part too small for us to coat. How long will my finish last? It depends on several factors including the type of finish, the surface you’re having coated, and the purpose of the part. It’s not uncommon for some finishes to last for years, provided they’re not abused or subjected to extreme conditions. Is powder coating the same as weather-proofing? It depends. No finishing technique is completely impervious to the elements. Unlike solvent-based paint, which can leave microscopic pinholes, powder coating features “cross-linked” materials that provide a waterproof finish. That depends on the size of the job. A week is average. But we’ll always give you our most honest assessment based on our current workload. We generally don’t do rush jobs since our emphasis is long-lasting quality, not speed. It’s easy – just call us or send us an email. In the rare event we don’t pick up the phone, we do our best to get back to you that day, the next day at the latest. Yes. You may Request a Quote here and after you’re satisfied with the quote we send you, you may submit payment online. We accept Visa & Master Card credit cards online via PayPal, as well as cash, checks and money orders in person. We require a 50% deposit prior to any work being done. However, we require full payment if you’re shipping your items to us. Can powder coating add value to my investments? In some cases, yes. Anything that improves the looks or performance of an item could raise its value. Do you pay finders fees for referrals? Absolutely. Well pay you 10% of the new business you bring our way. Just be sure that your referrals mention your name. By all means. We invite our customers to check us out first-hand. Please just give us a heads-up notice that you will be visiting us.